Abbotsbury Swannery is the only place in the world with a publicly accessible flock of nesting Mute swans. It offers a unique opportunity to get close to these beautiful, graceful birds. The magic at Abbotsbury is that you can be only a few feet away from nesting swans and you may even be lucky enough to see the cygnets hatching in late April and throughout May. 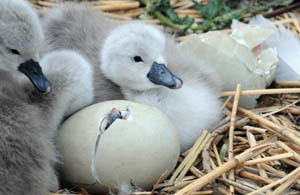 It’s quite an amazing site to see a tiny beak peeping through such a large egg as the cygnet struggles to hatch out. The swans move on and off the nest throughout the day so there’s a chance of getting a really good view if you wait around long enough. Swans breed from around the age of 4. Building their nest takes 2-3 weeks and they then lay an egg a day until they are ready to incubate. Incubation takes around 6 weeks and at Abbotsbury you will see swans at various stages of the nesting process during the breeding season. Some will already have young whilst others are still at the laying stage. Abbotsbury Swannery is on a sheltered 8 mile lagoon behind Chesil Beach known as The Fleet. It is home to around 600 Mute swans that are free to come and go as they please. The protection from the sea offered by the banks of Chesil Beach make it an ideal location for the swans and the reed beds provide perfect nesting material for them. Joining the flock are one or two black swans – not native to the UK but they are very much at home at Abbotsbury. Ducks, geese and other wild birds can also be seen and there is a hide provided for better viewing. For many, the highlight of a visit is the swan feeding which happens at 12pm and 4pm, along with informative commentary. You can find out about such things as the popular misconception that The Queen owns all the swans in England. Traditionally, all the country’s unmarked swans belong to the Monarch, with a small number of swans on the Thames belonging to the Guild of Vintners and the Guild of Dyers but The Queen generally only exercises her ownership on certain stretches of the Thames and its surrounding tributaries and for her to actually own swans they must be claimed for her. 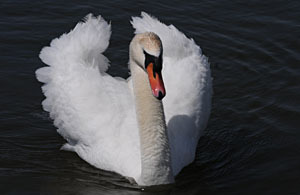 There are also a few families that own swans such as the Strangways (who bought Abbotsbury). The swans are ringed to indicate ownership. The Swannery was established in the 11th century by the Benedictine Monks of St Peter’s monastery who farmed them for food. They are no longer eaten though. The monastery itself was destroyed in 1539 but a few ruins remain around St Nicholas’ Church in the village. Abbotsbury Swannery is also interesting for its Bouncing Bomb. In 1943, Barnes Wallis tested his Bouncing Bomb on the waters of The Fleet and one of the recovered bombs is on display at the Swannery. It is also home to the oldest working Duck Decoy in the country and a willow swan maze. For wildlife lovers, Abbotsbury Swannery it’s a great place to visit. Bring your binoculars and a camera and enjoy watching the birds in their beautiful habitat.